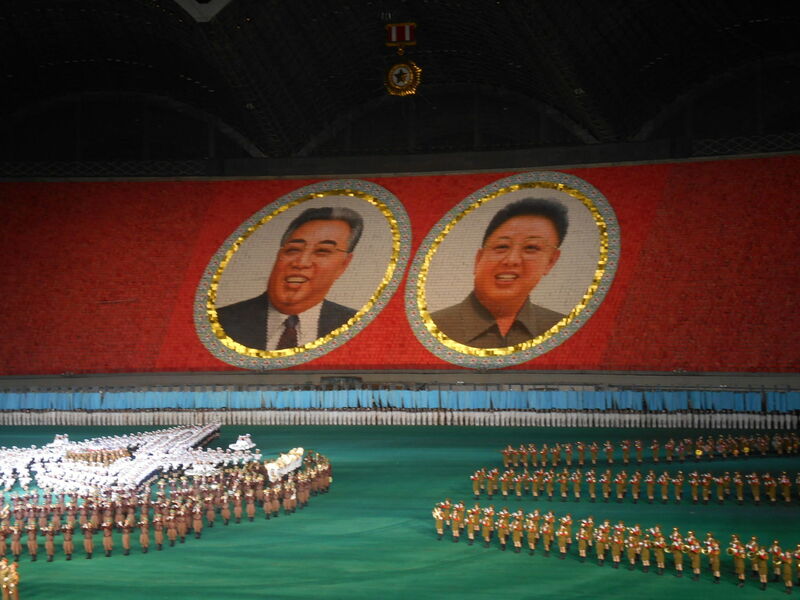 Kim Il Song and Kim Jong Il portrayed by cards at the Mass Games on National Day in Pyongyang, North Korea. Wow. 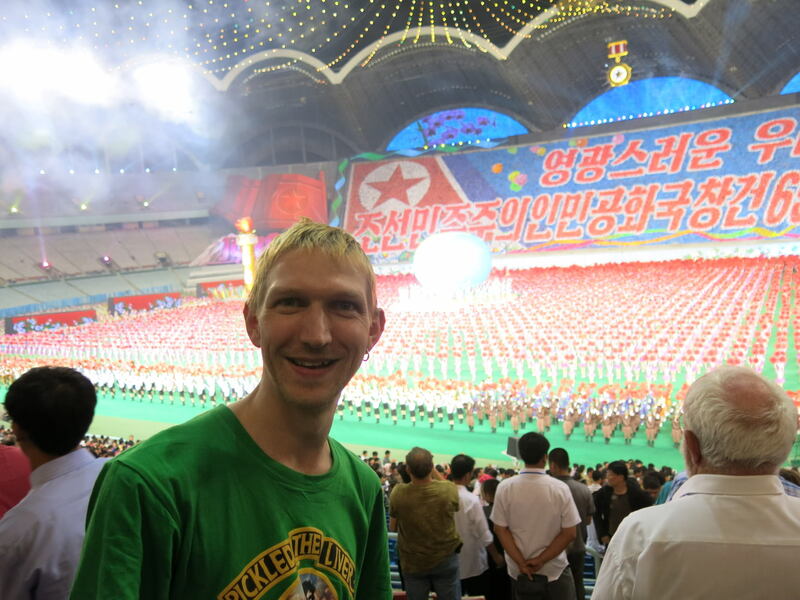 There I was, on National Day (9th of the 9th) in Pyongyang watching the biggest spectacle on earth, well asides the four yearly FIFA World Cup Final that is. You’ve heard a lot about the Mass Games and you might want to go to watch it. 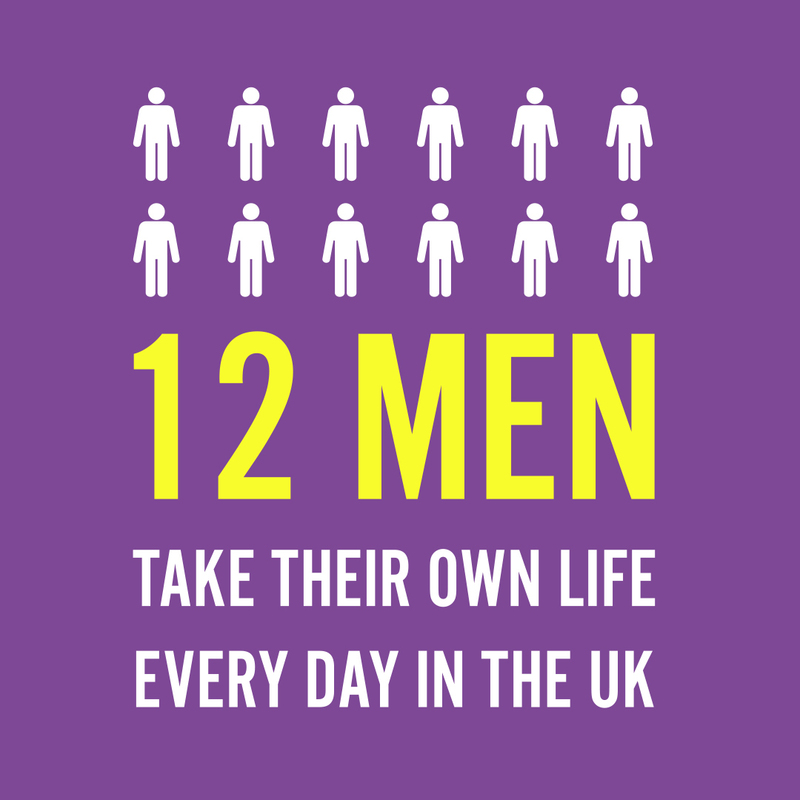 My advice is simple – do it. 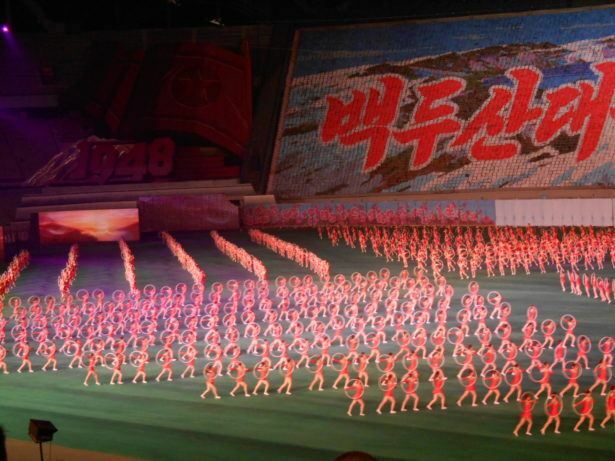 Get the tour booked – head to the Young Pioneer Tours website and try and coincide your tour of North Korea with the Mass Games. This is a massive 90 minute show which will have you gazing in awe. Outside the May Day Stadium with my ticket for the Mass Games on National Day! 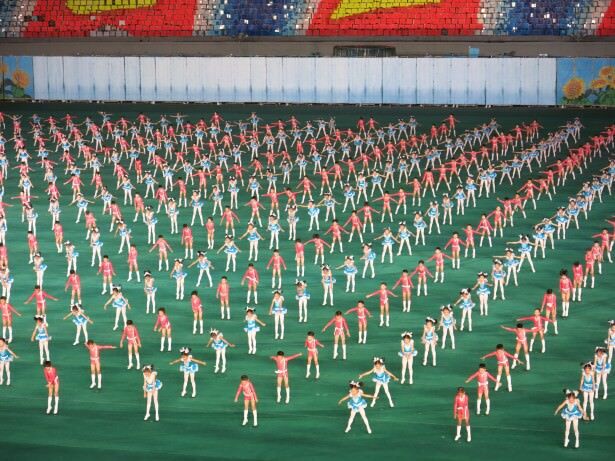 How do you book a ticket to the Mass Games? Well you don’t just go on the internet, pick your seat and book it that’s for sure!! It’s all done through your tour company – I’d highly recommend using Young Pioneer Tours and hope to introduce some reader discount for you all! (Watch this space) Young Pioneer Tours will look after you, book your trip and offer you the option to buy tickets for the Mass Games if your tour includes this and indeed if the Mass Games are on. When is the Mass Games on? It normally starts in August and ends mid September to coincide with National Day in the DPRK. We were delighted to be there on National Day (9th September). The Games are announced quite late, well they were this year so do check the Young Pioneer Tours website regularly – or even better e-mail the guys and keep touch with them. They’re an extremely cool tour company – Chris and Rowan were our guides – really top blokes. 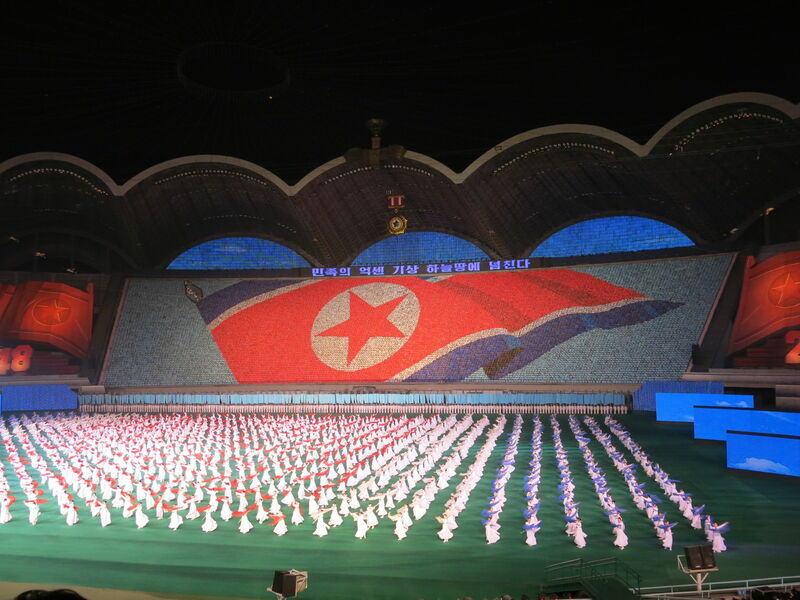 The North Korea flag during the Mass Games in Pyongyang. 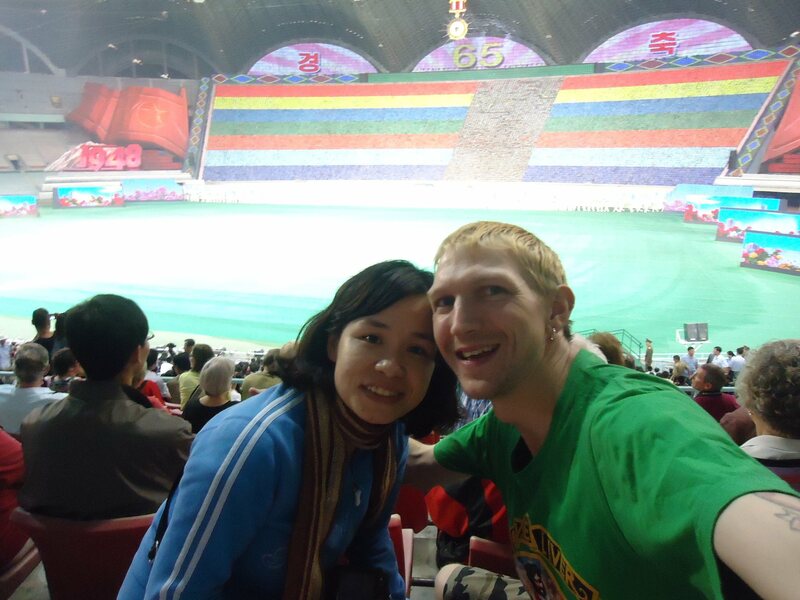 My girlfriend and I loving the Mass Games in Pyongyang. Spectacular. 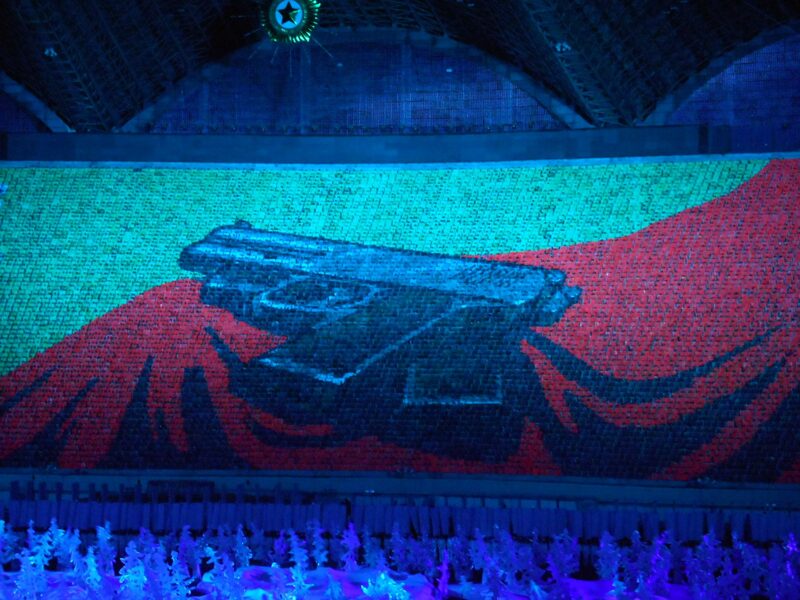 The biggest show on earth – the Mass Games. OK, except for the World Cup! Loving the Mass Games in Pyongyang on National Day. How do you get to the May Day Stadium for the Mass Games? Your bus will take you. 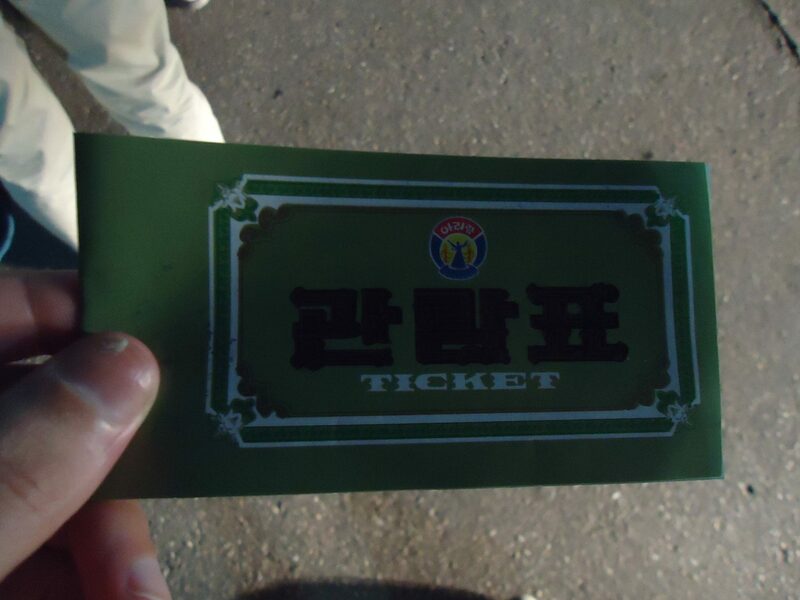 While in North Korea at the moment, you will go almost everywhere on the bus. 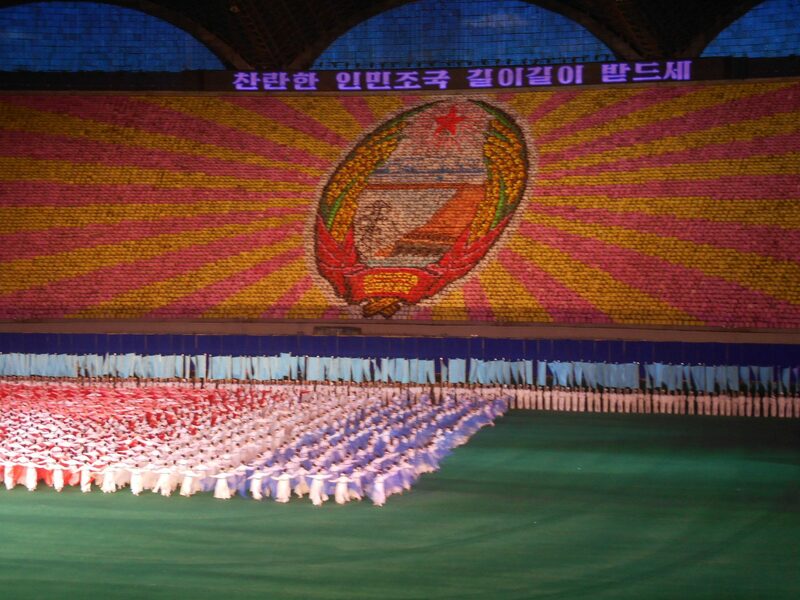 The only real exception will be a trip on the Pyongyang Metro and some walking around the city, plus the train to China which we also did. If you have a bit more money you can get a personal tour or be part of a group with less people. In this situation you may be able to get a taxi out there. 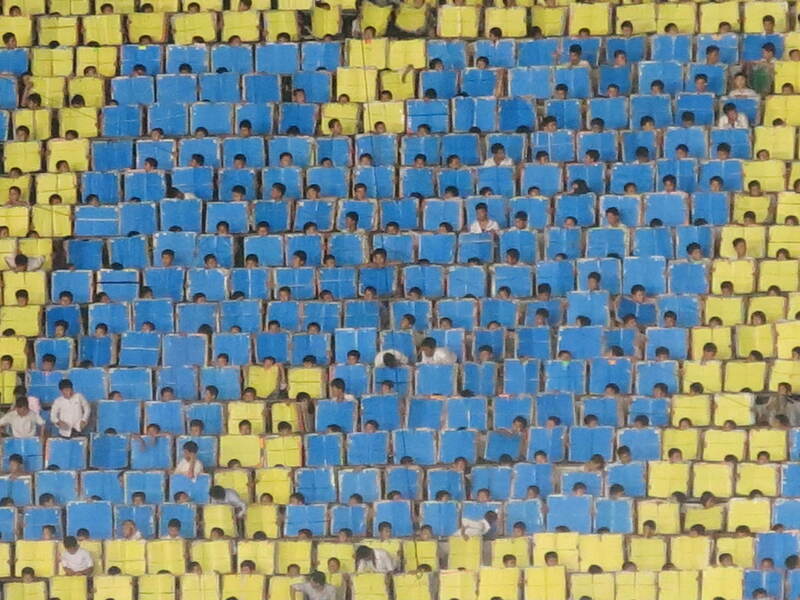 Either way, the May Day Stadium is situated on Rugna Islet on the Taedong River, and is accessed from the Chongryu Bridge. 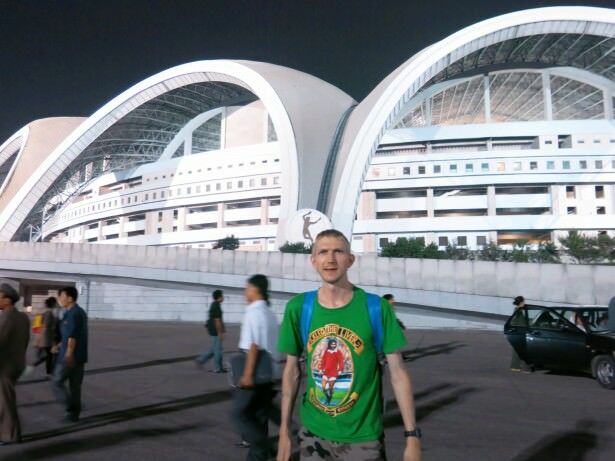 Arrival at the May Day Stadium in Pyongyang – largest stadium in the world for the Mass Games!! 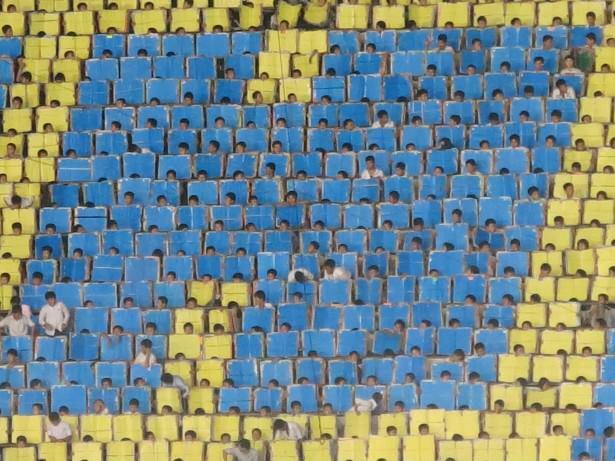 What is the May Day Stadium? 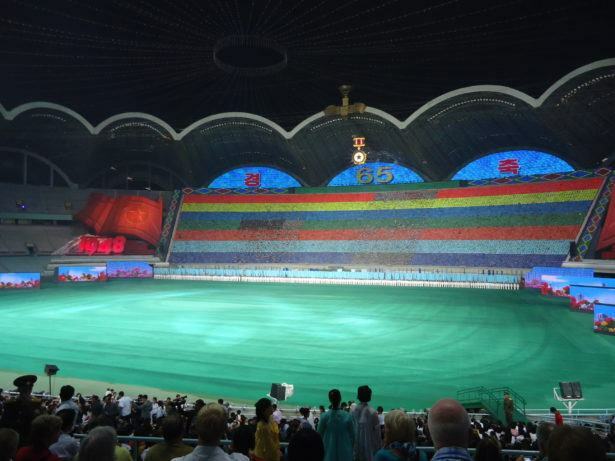 The May Day Stadium in Pyongyang is widely regarded as the largest stadium in the world. It’s pretty hard to disagree with this. 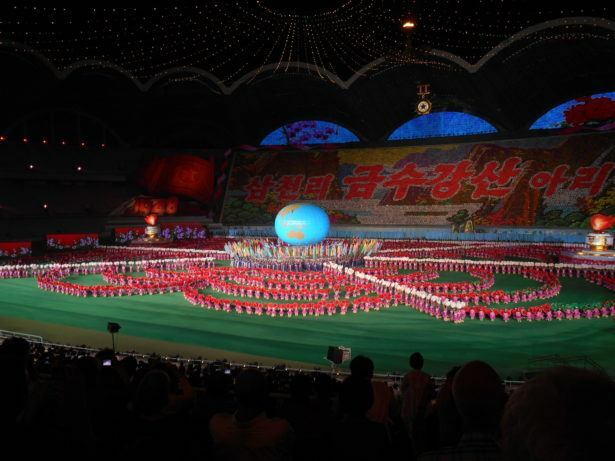 Figures range from a seating capacity of 150,000 to 200,000. This is very believable. Not only that, it’s not crampt for space at all, plenty of leg room and good vantage points all round. 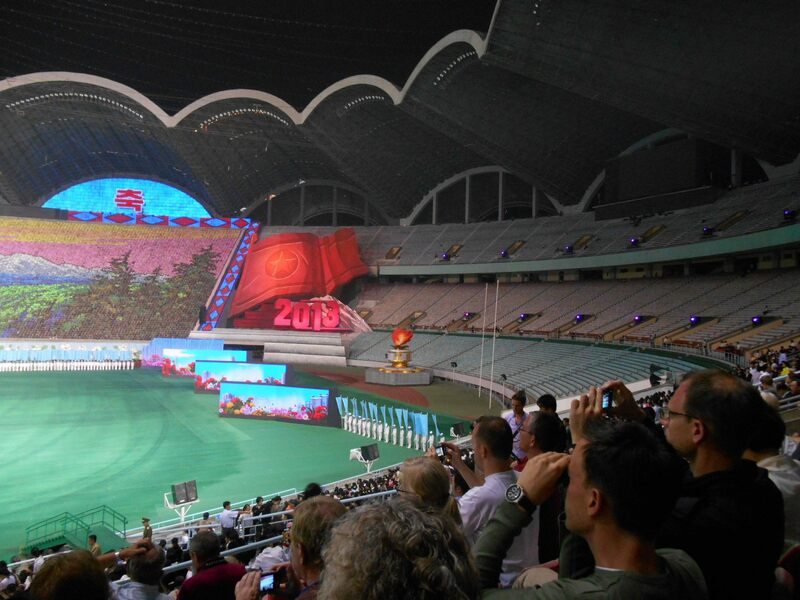 All in all a very well designed stadium. Wembley, The San Siro, The Maracana and Belfast’s Windsor Park are all bowing down in awe and jealous as hell. The May Day is a great venue. 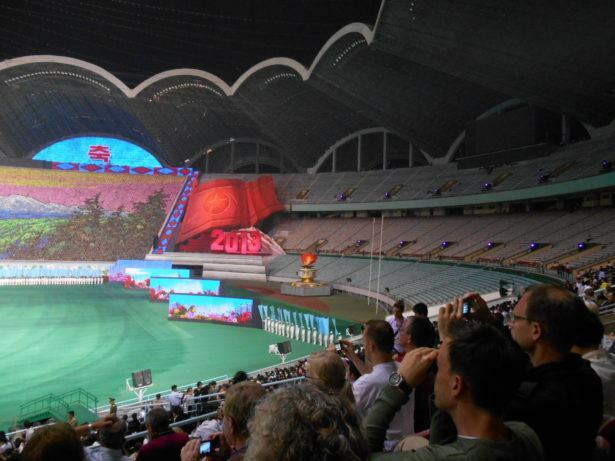 The May Day Stadium just before the Mass Games starts – it’s the biggest stadium in the world. 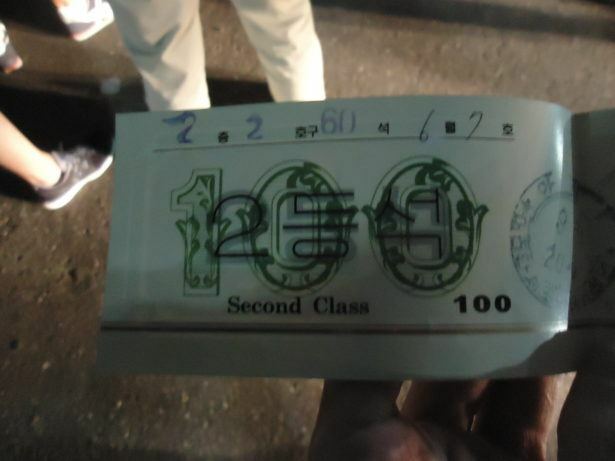 How much is a ticket for the Mass Games? From those four options, judge what ticket is best for you. 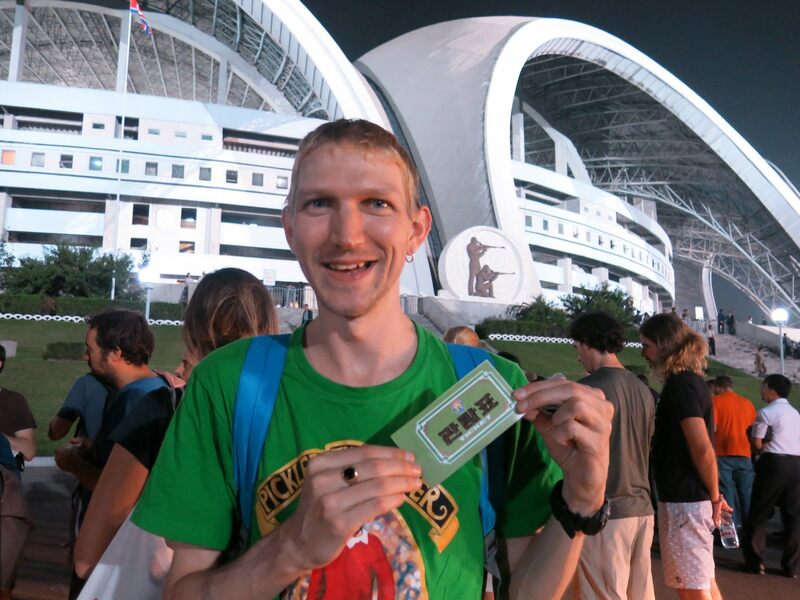 It might surprise you to learn that we chose the 100 Euro ticket rather than the 80 Euro one, as my girlfriend and I are real budget backpackers. However we felt this was a one off show, so splashed out the extra 20 Euros each. There wasn’t much difference though, so probably doing it again, I’ll take the cheaper seats and spend the 20 Euros on souvenirs or food instead. 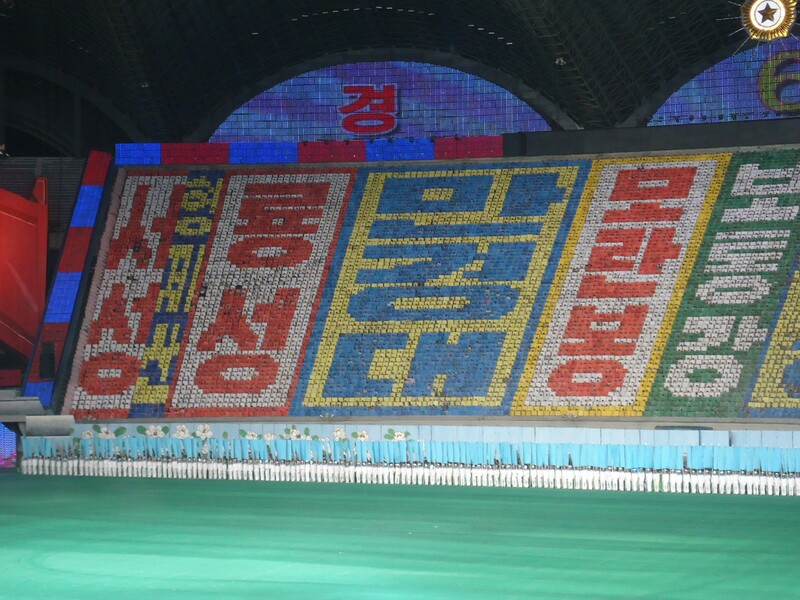 How long does the Mass Games last? 90 minutes. Though there is a warm up for about half an hour beforehand. 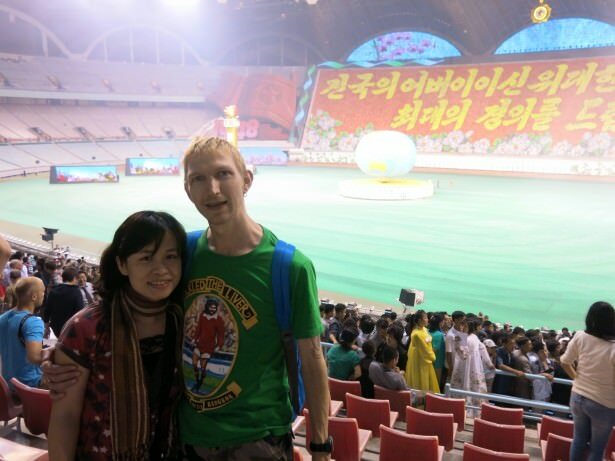 We arrived at the MayDay stadium at 7.30 pm, the Mass Games started at 8 pm and finished at 9.30 pm. This subject has been covered countless times before, but here’s a one paragraph overview from my perspective. The Mass Games is a spectacular audio and visual display of North Korean history, pride, culture and an overall performance by the locals to show the greatness of their country on a mass scale. From start to finish you will be enthralled by the sheer talent on display. 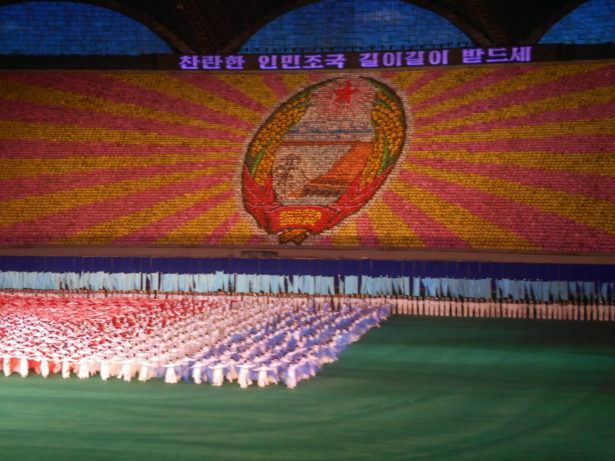 Synchronised dancers on the main stadium pitch. 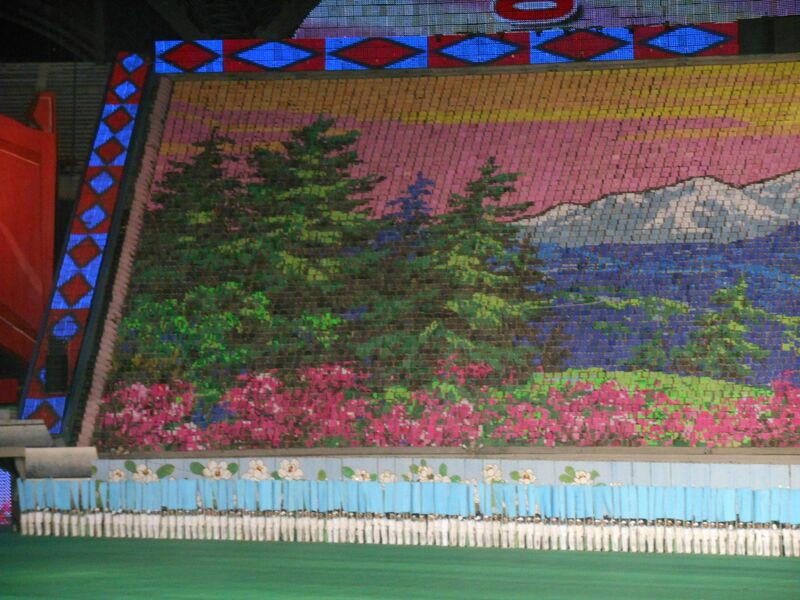 In the background, the images are constantly changing. 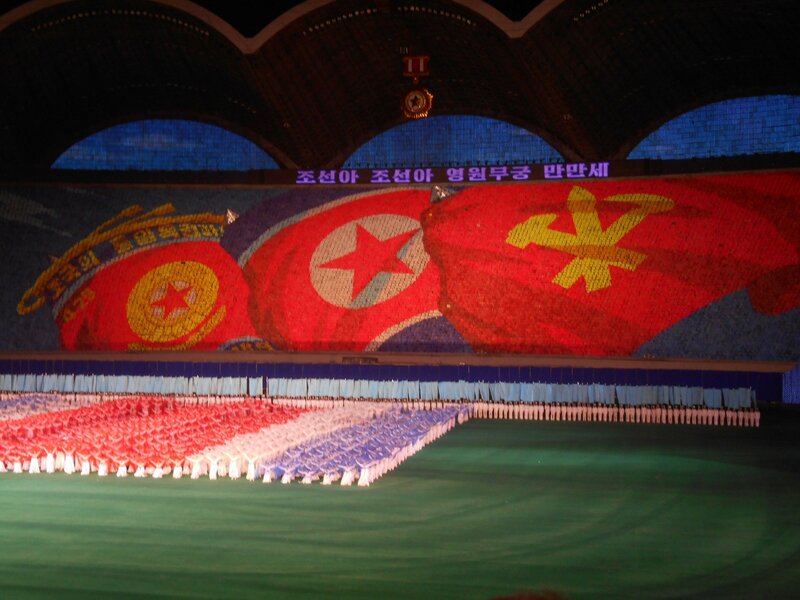 It shows a depiction of North Korea from the formation of the country right up to the present day. There is a lyrical song at one point, but the rest of the music is all instrumentals. It tells the history of the DPRK, right through the American War in Korea, the Cold War, the American War in Vietnam, the Great Leader Kim Il Song and the Dear Leader Kim Jong Il. 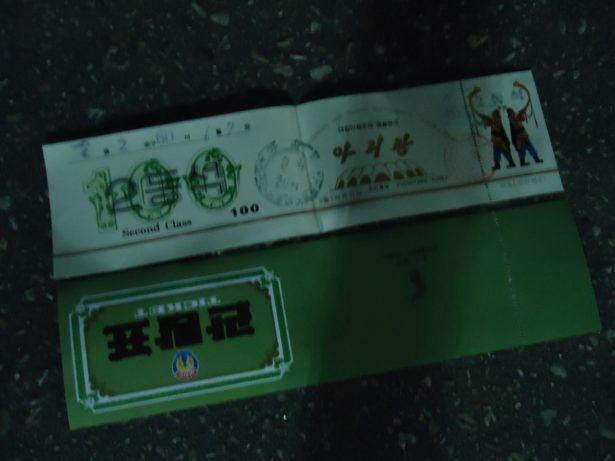 It’s insightful and provides a visual image of all that stuff you read on the North Korean regime. 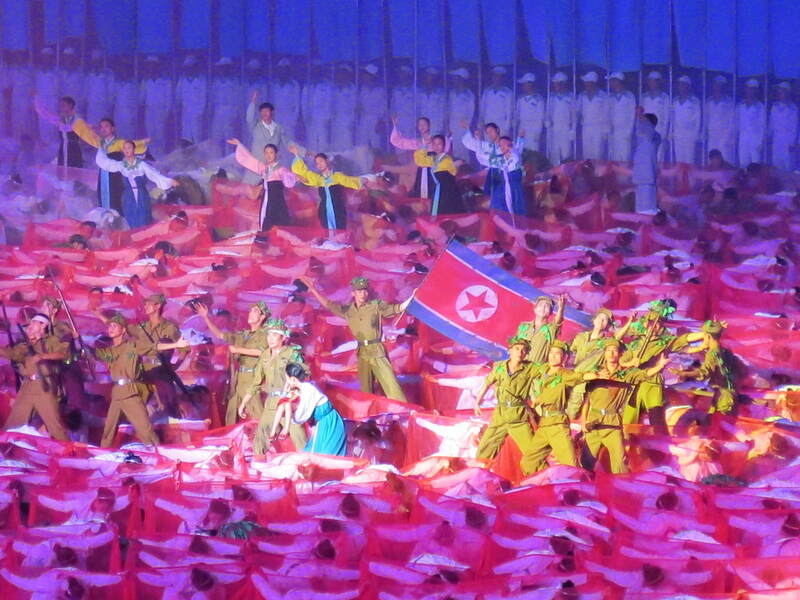 Synchronised gymnasts in the Mass Games in Pyongyang. In short – it’s fantastic and only an idiot wouldn’t love it. You have to admire the effort that goes into it, however you may also have to question how hard everyone works on rehearsals and perfecting this show, whether it is ethical or not. That is a debate for another day. 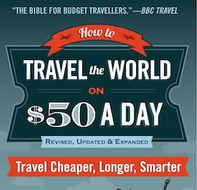 If you’re a backpacker like me – go in there, enjoy it, pay them money for it, applaud and don’t question it. This is their country, not yours. And that my friends is the bottom line. Why is the Mass Games so famous? 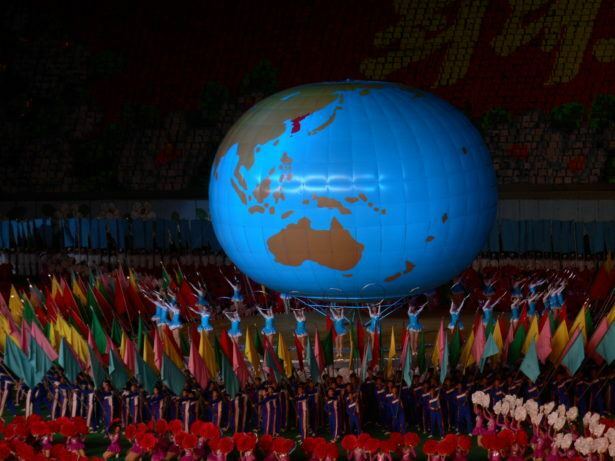 It has been recognised by the Guinness Book of Records in 2007 as the biggest event of its kind. People from all over the world come to the Mass Games. Over 100,000 people participate in it. What else is there to do at the Mass Games? You are there for the performance and that’s it. Photos and videos are completely permitted throughout so no problems there. You can also buy souvenirs and refreshments inside the stadium, all sorts of posters, postcards, t-shirts etc.. Things are reasonably priced. Your bag is not checked on the way in, so you could bring in your own water, as we did. 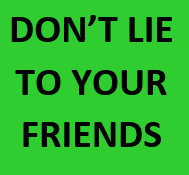 Alcohol is not sold inside, ask your guide if you can bring it in or not, and don’t leave any litter lying around. 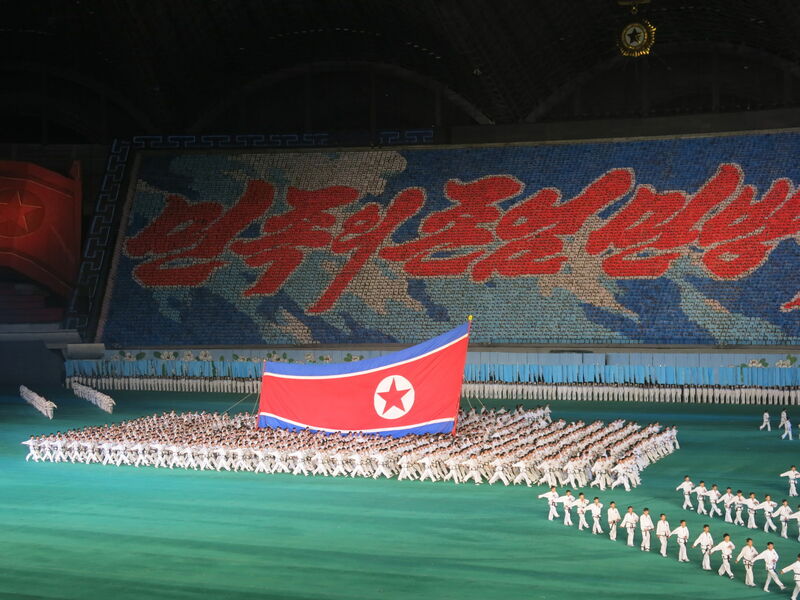 North Korea is a squeaky clean country. Leave it that way. Also make sure you go to the toilet on the way in – you really don’t want to miss any of the performance. You can also keep your Mass Games ticket as a souvenir. This entry was posted in Asia, Destinations, Destinations, North Korea, Pyongyang. Bookmark the permalink. 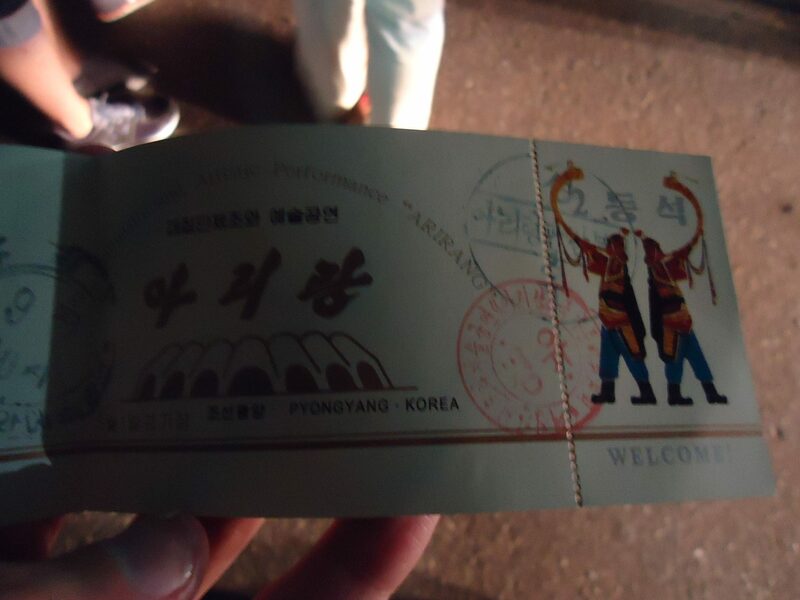 Pingback: Cheap North Korea Tours: 5% Discount with Young Pioneer Tours! !